Beginning in 2012, we committed to a sand topdressing program on the fairways of the South Course. Over the six years of continuous seasonal application the collective results have proven to perform successfully in several areas of anticipated improvement. At this point in time we are reaching the three to four-inch accumulation stage that was deemed to be the first significant measurement of a dedicated “sand capping” program. Overall, we can appreciate the results of smoother, dryer, and firmer conditions that benefit plant health, play presentation, and overall player enjoyment. As may also be inevitable with almost any “new” program, there can be side effects that are not necessarily positive and will very likely need separate attention as our initial goals are achieved. 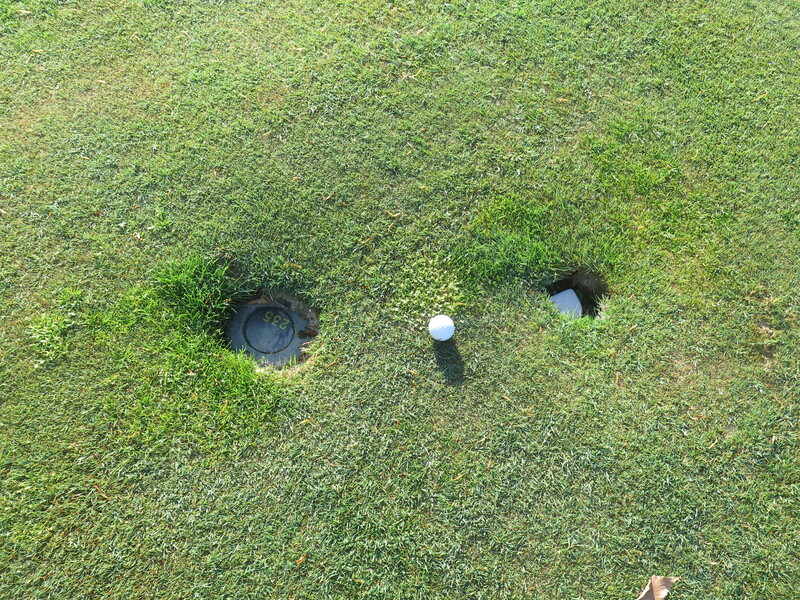 One good case in point can be witnessed within our fairway irrigation sprinkler system. Other than functioning in the critical role of water delivery, our irrigation sprinklers long ago became an added opportunity to provide players with yardage information. The old 150-yard bush was not enough. Even though the modern range finders of today are being found to be more reliable, many golfers still search out the sprinklers for yardage information. Considering the fact our yardage marker inventory list is over 1,200 caps, servicing them simply in terms of correct yardage on a continual basis has proven a challenging and time-consuming part of our maintenance duties. It has come time to service them to a far greater degree, because of the top-dressing program. That being physically raising them up to a proper level only slightly below surface grade. The process of raising low sprinkler heads on fairways is straight forward in theory. 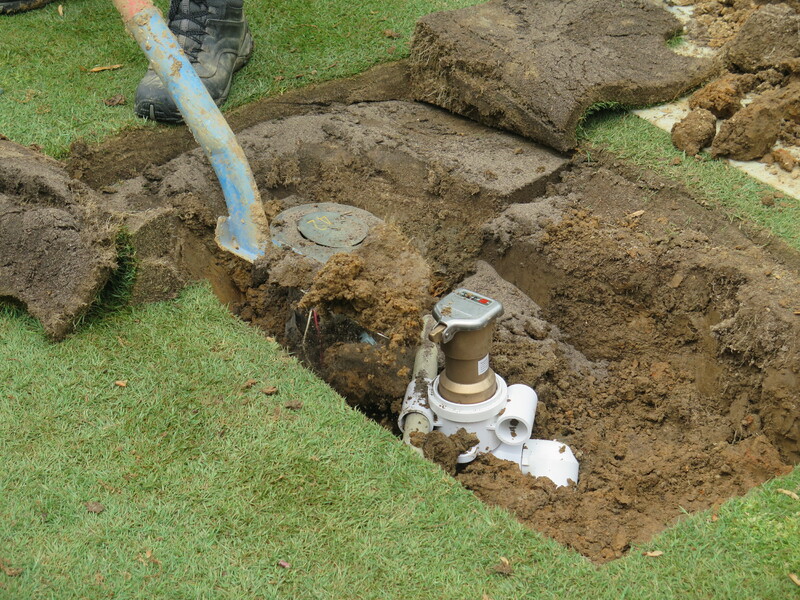 We begin by removing the turf surrounding the sprinkler to expose the underlying soil. Using smaller trenching shovels, we dig down all around the sprinkler to expose the entire sprinkler and “swing joint” which in most cases are of total plastic design. These two facets form the vertical portion and the connection to the deeper water lines running horizontally under the fairways. These swing joints are designed to be able to move a few inches up or down to adjust exact depth. Once enough of the swing joint is exposed, we can simply lift the sprinkler up to the appropriate height. Using a piece of 2” x 4” wood to ensure the top of the sprinkler sits even with surface level, we pack the soil from the hole around the sprinkler. Adding a few inches of soil at a time and tamping to compact provides a firm base underneath the sprinkler to make sure it does not sink to its’ original grade. Once all the soil is compacted back around the sprinkler, the turf that was first removed is put back into place and lightly tamped to level, leaving the area ready for play. The squares where the turf was cut will be visible for three to four weeks as they heal back together. Naturally, we hope that every time we embark on raising a sprinkler head it goes smoothly as described, but that is not always the case. The reality of dealing with a 27-year-old irrigation system is that sometimes we dig up things that can significantly complicate the procedure. The white quick coupling valves, which we use to connect our hand watering hose into the irrigation system and are located next to some of the sprinklers in the center of fairways, are a perfect and repeatable example. 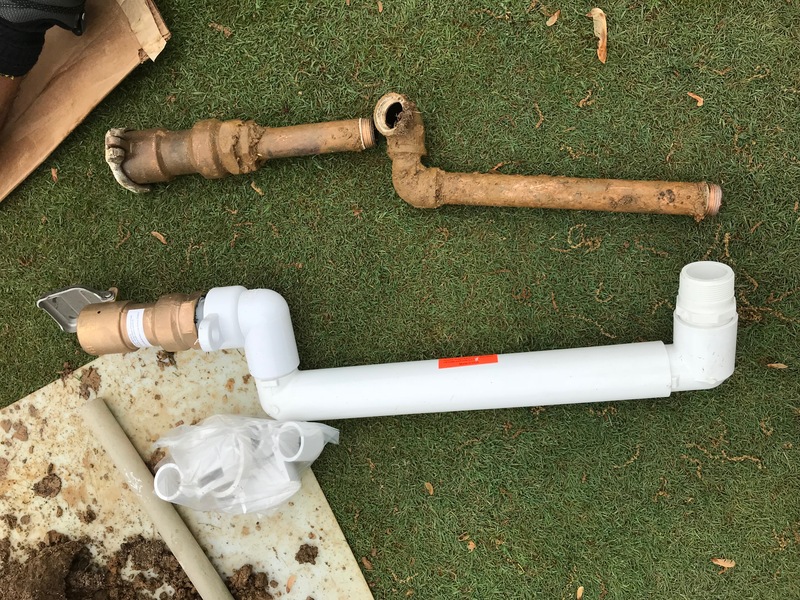 Thirty years ago, around the time our irrigation system was originally installed, it was common to use metal pipe for the swing joints that connect the quick couplers to the underground pipe, as opposed to the plastic of the sprinklers. Unfortunately, most metals sitting in the wet ground corrode over time and connections that were intended to be able to move (swing) no longer do without breaking. In this situation, the entire metal swing joint requires replacement with new PVC plastic. An added feature of this repair is that some, or occasionally all, of the fairway piping must be isolated and drained so that the work can be completed. The point to be made here is that we recognize the problem and will address it as a priority item as time and manpower are available. Over the past several years we have accomplished the same for all sprinklers surrounding greens on both courses by either raising or totally replacing them, a total of almost 800 heads. So it may take a considerable length of time to do but we will get started soon.